5 Tahukah Kamu Arti rungguh-2? A few days ago, someone asked for a simple employee assessment application. Even though! At that time, I had no idea at all about the application of employee assessment. Never mind imagining the flow, just imagining its use still cannot. He explained a little about what kind of application he wanted to make. It’s just that, I still don’t understand. Because I don’t understand, I then browse to find some references related to employee assessment. After getting a little description, I finally started making a project with a very simple flow. The employee assesment I made yesterday used 4 (four) tables, namely: users, criteria, employments, and reports. The users table is used to store application user data, table criteria are used to store assessment criteria, table employements are used to store employee data that is assessed, table reports are used to store assessment data. The users table contains 3 (three) columns, namely: id, username, displayname, and password. The criteria table contains 3 (three) columns, namely: id, name, and weight. The idea column is used to store the criteria id, the name column is used to store the criteria name, and the weight column is used to store the criteria value weight. The employments table only contains 2 (two) columns, namely the id and name fields. The id column is used to mark entries in record reports. Table reports contain 4 (four) columns, namely, id, employers, criteria, and values. The id column used for assessment ids is automatically added (auto increment), the employers column is used to store employee IDs that are assessed, the criteria column is used to store the criteria id, and the value table is used to store the values entered by the application user. After all employee values are summed up then sorted in descending terms and taking the top 3 employees. 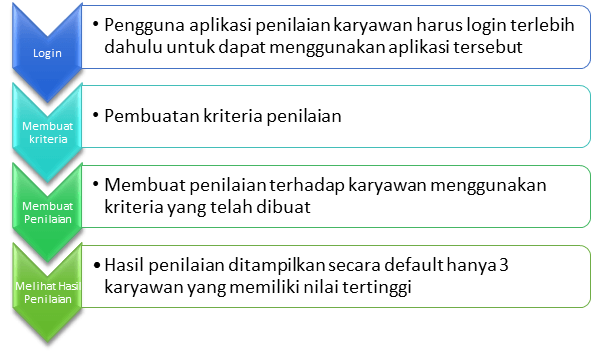 That’s the design of a simple employee application and then I use PDO dan MySql.